After being escorted away from Hofstra University ahead of the first presidential debate on Monday, Green party candidate Jill Stein took to Twitter to share her views as the two major party candidates faced off. Stein fell far short of the Commission on Presidential Debate's requirement that candidates must be polling at 15 percent or more to earn a spot on the stage — Stein was averaging 3.2 percent, according to the commission. But still, she jumped on the opportunity to have her policies lined up next to Hillary Clinton's and Donald Trump's. Ultimately, Stein's tweets made me wish she had debated on the main stage to present her extremely progressive politics. Stein's policies skew much farther left than those of Clinton or Trump on nearly every issue — and even farther left than many of Vermont Sen. Bernie Sanders' proposals. Given the impact that Sanders arguably had on Clinton's positions throughout the primaries, it would have been interesting to see if Stein's presence on the debate stage exerted a leftward pull on not only Clinton, but Trump as well. But more importantly, it would have been a service to the viewing public to hear from someone other than the major-party candidates, with whom the electorate is not thrilled. As Clinton and Trump both try to appease their voter bases while being careful (to varying degrees) not to completely alienate disenchanted voters from the other side of the aisle, Stein is unrestrained in her ability to state exactly what she supports and why. And she didn't tone down her far-left agenda one bit on Monday night. She kicked off her debate participation by plugging her ambitious "Green New Deal," a proposal to create 20 million jobs in the energy sector and move toward 100 percent reliance on renewable energy by 2030. Some climate activists, including Stein, are critical of Clinton's work as secretary of state, arguing she promoted the use of fracking abroad; meanwhile, Trump supports the continued use of coal. Stein opposes the use of fracking and coal, and she thinks we can rely on wind, solar, and other forms of energy generation in just 14 years with substantial investment of money and labor in the program. Stein would have cast doubt on whether Clinton is doing enough to combat climate change had she been on the stage. Stein also went hard on the issue of systemic racism, something Clinton did discuss at the debate in the context of the criminal justice system. Stein connected mass incarceration to the history of racism against black people in the United States going back to the time of slavery. And she retweeted the Green party's statement mentioning the "War on Drugs" in connection with mass incarceration, an issue which neither major-party candidate brought up during the debate. She also mentioned Black Lives Matter, which neither Trump nor Clinton did. I believe Stein would have joined Trump — and possibly gone even harder — in pointing out Clinton's support, as first lady, of the crime bill her husband signed into law as president, which, critics argue, has contributed to some extent to the current incarceration rate with its mandatory minimum sentencing laws. 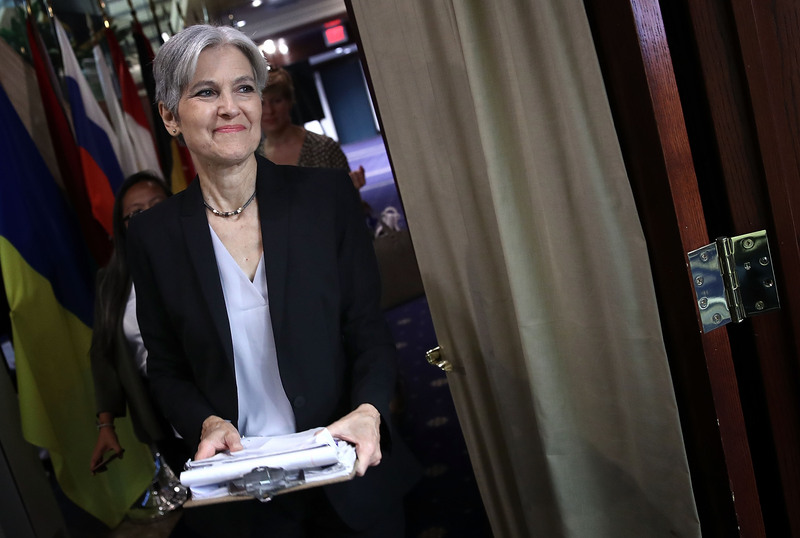 But where Stein may have shone most on Monday is on the topic of foreign policy. Staunchly pacifistic, Stein wants to cut the military budget by 50 percent or more and close up most or all of the U.S. bases around the world. Trump took advantage of the opportunity to criticize Clinton's record of supporting interventions in Iraq and Libya during the debate, stating that they primed the soil for the rise of ISIS. But Trump's own lack of detailed foreign policy proposals, such as how he'd proceed to deal with ISIS aside from bombing oil fields abroad, could dampen the blow of his criticisms. Stein, for her part, thinks we should rely on cutting off funding to terrorist organizations, stop the drone strikes (which Clinton supports), and stop intervening militarily, which only makes us unsafer in her opinion. I believe that many voters who are highly concerned with the U.S. military actions that have taken place since the Sept. 11 attacks would have found a voice that resonated with them had Stein debated. But alas, Americans were only presented with two voices at the first presidential debate, and Stein wasn't given the chance to reach a large audience of potential new supporters. I believe viewers missed out on a fiercely progressive agenda Monday.